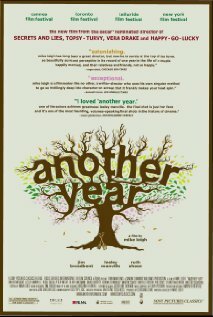 Another Year is a beautifully original and endearing film. Jim Broadbent and Mary Sheen team together and play the characters Tom and Gerry perfectly. Funny at times, sad a lot of the time yet heartwarming and thought-provoking too. What makes this film powerful is the characterisation and subtlety of plot. The way that events unfold softly and the capturing of this through clever camerawork gives the viewer the upper hand: we are given the power to see through the characters not only neutrally, but through the eyes of Tom and Gerry too. Particularly impressive is the way that characters are uncovered through the film's progression. We see development and deterioration in some, yet there are others that remain unchaged. Furthermore, while on the one hand we learn more about Mary as the film goes on, we learn very little about Tom and Gerry: If we compare how much we learn about the couple from the beginning to the end, it is little. Yet, despite of this, we feel closer to the pair and more aligned to their way of thinking than we ever do to Mary. The characterisation, subtelties and camerawork give Another Year the edge of realism that puts it head and shoulders above other modern dramas. Theway in which it captures life makes it wholesome: how we all cope with what is trown at us and in turn how that makes or breaks us. Incredible acting worthy of many more awards.